Kyotherm is making plans to fund its first-ever installation for solar process heat, a system of about 15,000 m² of collector area, or 12 MWth, to supply a malting plant in France with thermal energy. The company is a third-party equity investor focused on financing renewable heat installations and helping commercial clients in the implementation of heat purchase agreements. So far, it has been involved in 17 projects, which dealt with waste heat recovery at a steel factory, geothermal heat at a leisure park near Paris and biomass heat from boilers installed in the UK. “We not only finance projects by securing low-cost capital but also facilitate their implementation by contributing to contractual and industrial structuring. Our partners, such as suppliers of solar thermal technology and project developers, are paid for their work before we sell heat to clients via long-term Heat Purchase Agreements,” said Rémi Cuer, Investment Manager at Kyotherm. A typical renewable heat project will see Kyotherm in charge of contract negotiations with multiple parties. 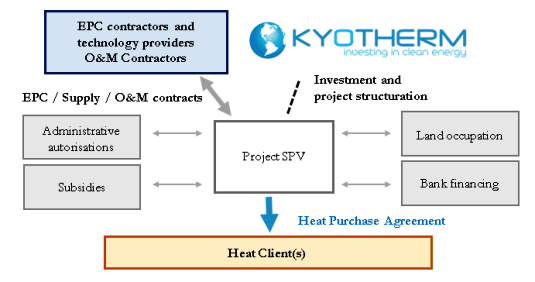 During the above-mentioned project to provide SHIP, or solar heat for industrial processes, Kyotherm will supply renewable heat to an industrial client at a discount on current and anticipated heat prices. Cuer expects the tender for the solar field to be offered in a few weeks. Construction is scheduled to start in the first quarter of 2019 and commissioning is planned for the third. 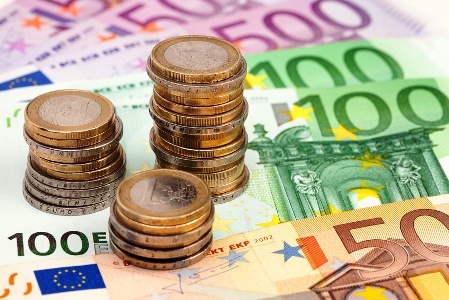 Between 60 % and 65 % of CAPEX, estimated at EUR 5.5 million to EUR 6 million, will reportedly be covered by a mix of grant and low-interest loan under French energy agency ADEME’s large-scale solar thermal support scheme. "We have already reached two important milestones in this project: pre-approval for ADEME funding and the signing of a 20-year heat purchase agreement with the industrial client,” said Cuer. Kyotherm says it adds value by facilitating Heat Purchase Agreements, which are more difficult to draw up than Power Purchase Agreements. Electric power can be fed into the public grid, whereas heat supply needs to be available during a certain time frame. And while clients expect output guarantees, SHIP plant operation requires constant, high demand at predetermined temperature levels. Regarding the malting plant project, Kyotherm has teamed up with NewHeat, Dalkia and Sunoptimo. The French company NewHeat has been tasked with designing the system, supervising its construction as well as operating it later. Energy service company Dalkia from France, which has special expertise in the management of industrial energy supply systems, will be responsible for integrating the SHIP plant into the factory. Belgian-based Sunoptimo, on the other hand, specialises in prefabricated solutions for heat transfer units within commercially used solar heat systems. “The CAPEX of projects that we fund is between EUR 500,000 and EUR 40 million. We are backed by institutional investors that are independent from industrial businesses,” said Cuer. Projects, however, need to be based on ESCO models. Kyotherm does not invest in deals to purchase technology only. Industrial demand for ESCO-based heat services strongly depends on the cost of fossil fuel. Since the price of gas has risen across Europe over the past months and a carbon tax has been implemented, Kyotherm has been receiving more requests from manufacturing companies. “Managers have been particularly interested in predictable heat costs over a longer period,” Cuer said. Five of the 17 projects which the company has completed so far were requested by customers from industry.